How do you encourage your brokers to get more involved in your real estate brokerage? Have you ever wondered how to encourage your brokers to get more involved in your real estate brokerage? Despite a decline in the number of potential buyers, brokers continue to come to the office and work on various files. 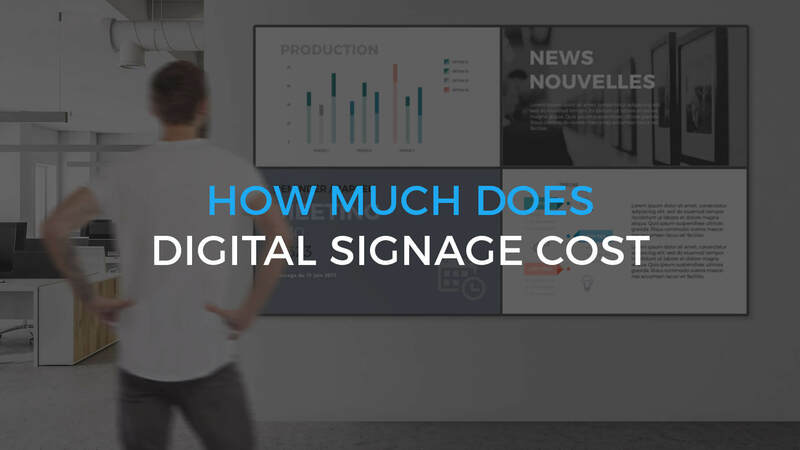 The previous article discussed the different uses of digital signage for potential buyers. 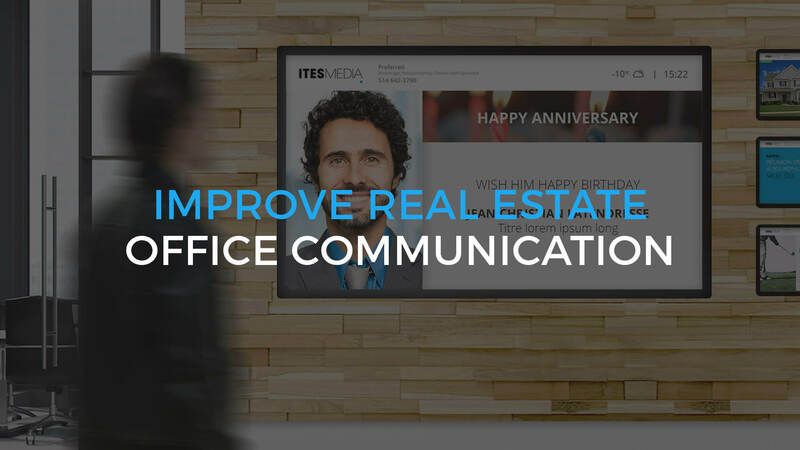 This time, we will discuss the benefits of using digital signage for internal communications with your brokers and brokerage staff. 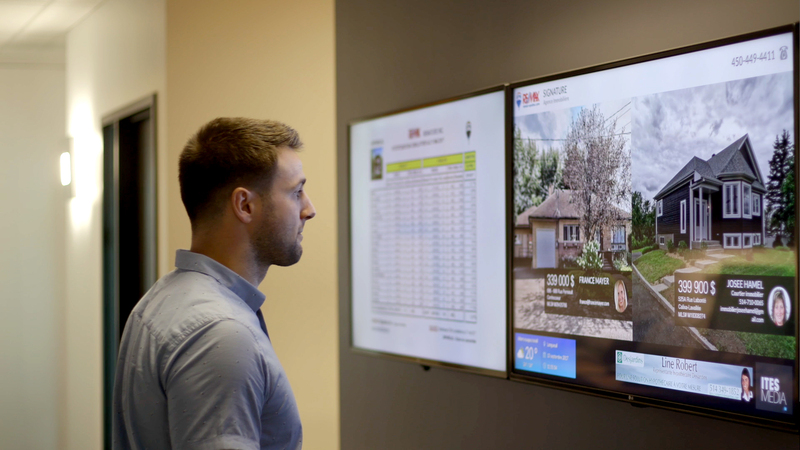 The first advantage of using digital signage within your real estate brokerage is the ability to give information on real-time listings. Entries will be automatically posted and updated on your screens; you can classify them as you see fit. It is also possible to make a list of all the brokerage new listings as shown on the image below. You can display the listings that have undergone a price adjustment as shown with the four properties at the bottom of the image. This way, brokers will be able to share with their clients, new properties that may interest them. As you already know, the real estate market is changing rapidly; new listings come and go very quickly. Therefore, brokers should always be aware of any changes in their sector. Another use of digital signage is the management of brokers and brokerage staff. They can update their status in the software to signify their presence at the office or to let you know if they are meeting with a client or visiting a property. As an brokerage manager, you must be aware of the whereabouts of your brokers in order to facilitate staff management. This technique will help you establish the right moment to organize a team meeting. It will also let you know which brokers are available to meet with a walk-in client. Feel free to use your brokerage screen to share messages with your brokers. This will help improve internal communications. Announce the arrival of a new broker and welcome him / her through a message on the screen or send motivational messages to your brokers. Your message can be as simple as wishing them a great day, highlighting their participation in a fundraising event, mentioning their children's sporting performances, etc. Take interest in your brokers and make them shine within your brokerage! More formally, let your brokers know about the warranty programs they have access to and share all news related to the brokerage; Use the banner to share a new point of service. Most real estate brokerages are now using social networks like Facebook, Instagram, Twitter and Linkedin. Feel free to share your social media posts on the brokerage screen. This way, brokers and brokerage staff will be aware of everything that is going on. Also, more and more brokers are active on social media, so it would be a good idea to share their posts on your screen and vice versa. In conclusion, digital signage within a real estate brokerage helps to modernize and dynamize your working methods. Manage the attendance of your brokers at the office, post daily messages such as motivational messages and finally, share information about your brokerage listings. 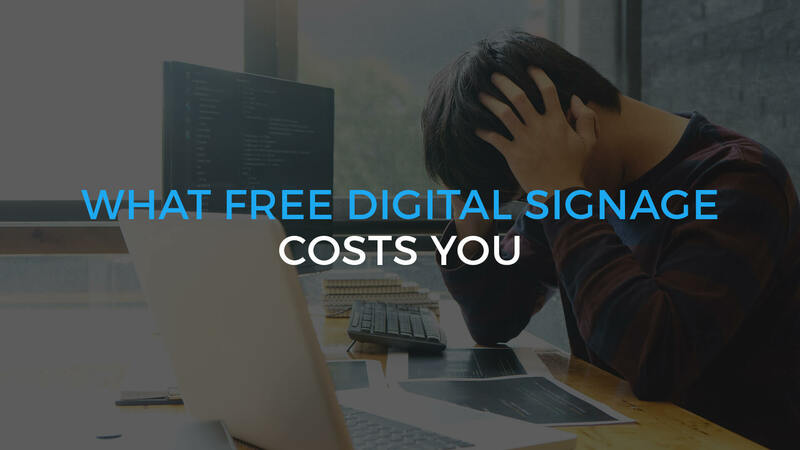 Make sure your digital display screens match your needs. For this reason, we suggest that you consult with an expert in the field who will answer all of your questions. If you have any questions regarding the installation of a digital display screen in your real estate brokerage, please do not hesitate to contact us. We would like to help you achieve your goals!